Received 30 August 2011; revised 30 September 2011; accepted 15 October 2011.
gleton Cesarean delivery at ≥22 weeks’ gestation. groups (108 ± 7 vs. 106 mmHg ± 10 mmHg, p = 0.29). the portions given in this document. 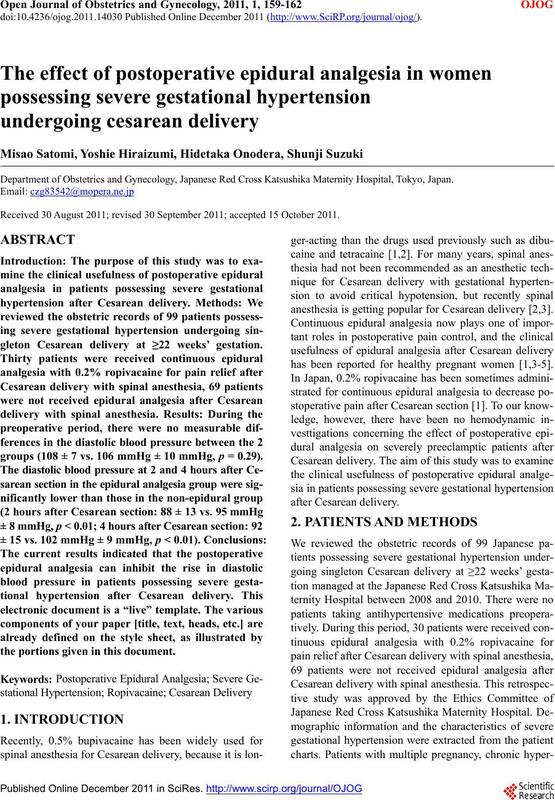 anesthesia is getting popular for Cesarean delivery [2,3]. has been reported for healthy pregnant women [1,3-5]. occasions at least six hours apart with the patient at rest. and low platelets count (LP) previously reported. travenous infusion of nicardipine HCl was started. and the Student’s t-test for continuous variables were used. 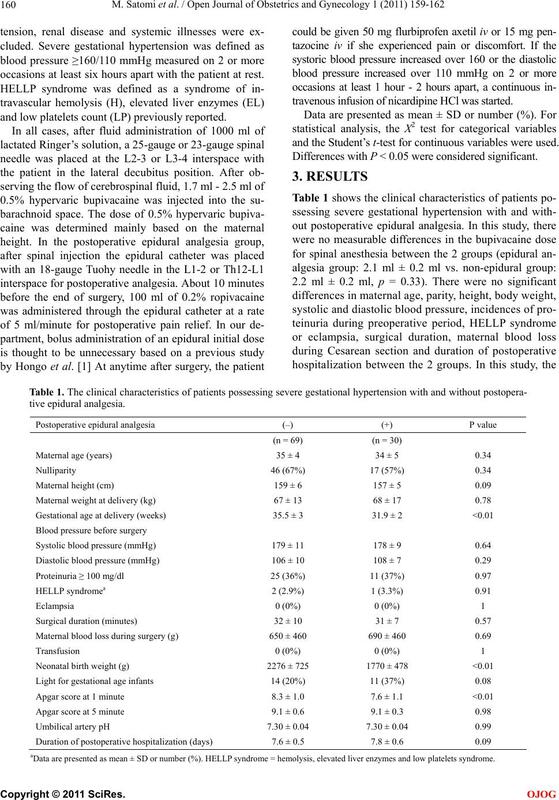 Differences with P < 0.05 were considered significant. aData are presented as mean ± SD or number (%). HELLP syndrome = hemolysis, elevated liver enzymes and low platelets syndrome. rs between the 2 groups. receiving intravenous infusion of nicardipine HCl. Data are presented as mean ± SD or number (%). this difference may be needed. 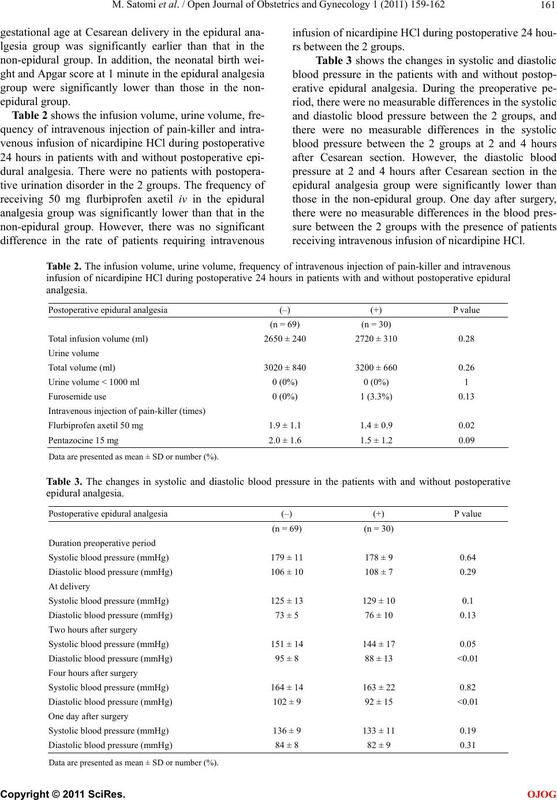 ded concerning the changes in systolic blood pressure. ean section. 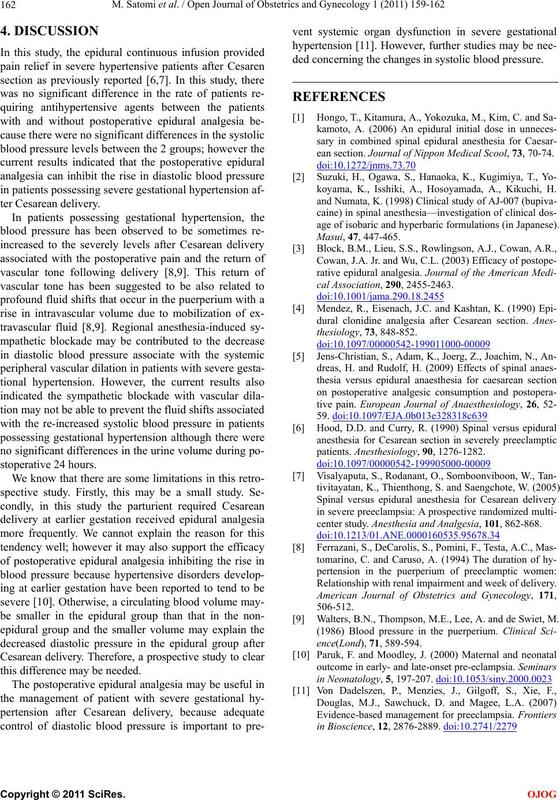 Journal of Nippon Medical Scool, 73, 70-74.
koyama, K., Isshiki, A., Hosoyamada, A., Kikuchi, H.
age of isobaric and hyperbaric formulations (in Japanese). center study. Anesthesia and Analgesia, 101, 862-868. Relationship with renal impairment and week of delivery. Walters, B.N., Thompson, M.E., Lee, A. and de Swiet, M.